Sharon Percy Rockefeller, president and CEO of WETA Washington, D.C., announced the broadcast plans for “Willie Nelson: The Library of Congress Gershwin Prize for Popular Song,” a PBS music special honoring singer-songwriter Willie Nelson’s receipt of the Library of Congress Gershwin Prize for Popular Song. 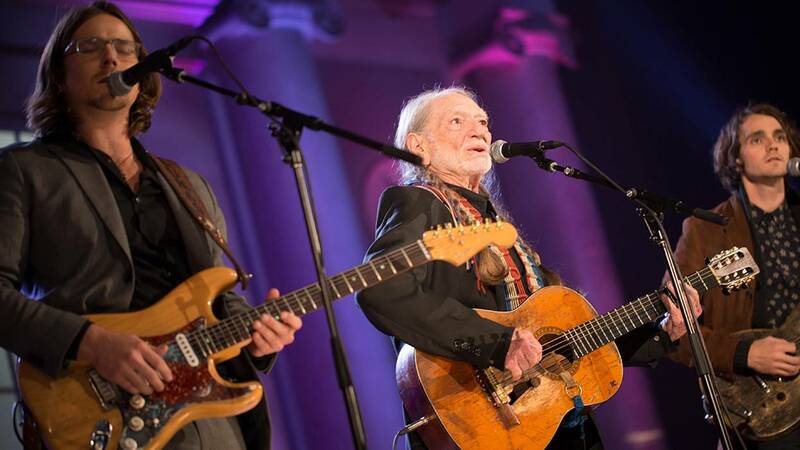 The event, taping Nov. 18, 2015 at the Daughters of the American Revolution (DAR) Constitution Hall in Washington, D.C., will feature performances by Nelson, as well as Edie Brickell, Leon Bridges, Rosanne Cash, Ana Gabriel, Jamey Johnson, Alison Krauss, Raul Malo of The Mavericks, Neil Young, Lukas Nelson & Promise of the Real, Buckwheat Zydeco and past Gershwin Prize honoree Paul Simon — with Don Was as music director (program subject to change). During the event, Nelson will be presented the Gershwin Prize by David Mao, Acting Librarian of Congress, and a delegation of Members of Congress. The program will premiere Friday, Jan. 15, 2016 at 8 p.m. CT on OETA, as part of PBS Arts. The program will also be broadcast at a later date via the American Forces Network to American servicemen and women and civilians at U.S. Department of Defense locations around the world. The Library of Congress Gershwin Prize for Popular Song is named in honor of the legendary George and Ira Gershwin. This award recognizes the profound and positive effect of popular music on the world’s culture. The prize is given annually to a composer or performer whose lifetime contributions exemplify the standard of excellence associated with the Gershwins. The Gershwin Prize was first awarded to Paul Simon in May 2007, followed by Stevie Wonder in February 2009, Sir Paul McCartney in June 2010, the songwriting team of Burt Bacharach and Hal David in May 2012, Carole King in 2013, and Billy Joel in 2014. With a career that spans six decades, Nelson’s music pushes genre boundaries and his lyrics give voice to America’s heartland. He put his imprint forever on country music and introduced it to new audiences by expanding music’s avenues in the 1970s to create “outlaw country.” He has continually broadened his musical language, crossing into jazz, blues, folk, rock and Latin styles. A guitar virtuoso with a unique voice, Nelson is an artist whose work continues to inspire new musicians of diverse genres. “Public media invests in content that tells America’s story — a story that is more diverse than ever. We connect Americans on air, online and throughout America’s communities to our culture through music, art, and the spoken word. This is especially important at a time of great cultural and technological disruption. The Corporation for Public Broadcasting is pleased to support ‘The Library of Congress Gershwin Prize for Popular Song’ and the authentic storytelling and enduring musical contributions of Willie Nelson to our country’s musical heritage,” said Patricia Harrison, president and CEO of the Corporation for Public Broadcasting. With 200-plus recordings, Nelson is the creative genius behind the historic albums Shotgun Willie, Red Headed Stranger and Stardust. An iconic Texan, he is also the songwriter of many country-music standards, including “Crazy,” “Hello Walls” and “Funny How Time Slips Away.” Nelson has earned numerous awards as a musician and earned extensive credentials as an author, actor and activist. He continues to thrive as a relevant and progressive musical and cultural force. Earlier this year, he released a new collaboration with Merle Haggard, Django and Jimmie, which debuted at No. 1 on the Billboard Country Album chart and in the Top 10 (No. 7) on the Billboard 200 Bestselling Albums chart. In the last five years, Nelson has delivered nine other new releases, one of which received a GRAMMY Award nomination; released a New York Times best seller; graced the cover of Rolling Stone magazine; headlined Farm Aid — an event he co-founded in 1985 — and received his 5th-degree black belt in Gongkwon Yusul. In 2013, Nelson’s albums included Let’s Face The Music and Dance, an album of pop-country repertoire classics performed with patented ease by Nelson and Family — his long-time touring and recording ensemble — and To All The Girls…, which features 18 duets with music’s top female singers. In 2014, he released Band of Brothers, a 14-track studio album of new recordings that debuted at No. 1 on Billboard’s Country album chart and at No. 5 on Billboard’s Top 200 album chart. “The Library of Congress Gershwin Prize for Popular Song” has been produced by WETA for PBS since 2007, with the support of PBS and the Corporation for Public Broadcasting. Spanning from June 2007 to the most recent broadcast in January 2015, these events have honored the musical genius of Paul Simon, Stevie Wonder, Sir Paul McCartney, Burt Bacharach and Hal David, Carole King and Billy Joel. The talented line-ups celebrating the honorees have included Yolanda Adams, Marc Anthony, Tony Bennett, Wayne Brady, the Jonas Brothers, Elvis Costello, Sheryl Crow, Gloria Estefan, Michael Feinstein, Faith Hill, Diana Krall, Lyle Lovett, Martina McBride, John Mellencamp, LeAnn Rimes, Emeli Sandé, Jerry Seinfeld, Kevin Spacey, Esperanza Spalding, James Taylor, Will.i.am, Jack White and Stevie Wonder. “Willie Nelson: The Library of Congress Gershwin Prize for Popular Song” is a co-production of WETA Washington, D.C., and Bounce AEG. The executive producers are Dalton Delan, Michael Strunsky and Mark Rothbaum. The producers are Tim Swift and Kristi Foley. The music director is Don Was. Funding is provided by The Ira and Leonore Gershwin Fund and The Leonore S. Gershwin Trust FBO The Library of Congress Trust Fund Board. Major funding is also provided by the Corporation for Public Broadcasting, PBS and public television viewers. Air transportation is generously provided by United Airlines.